W is for Workers’, as in Workers’ Ride Yeahhh! A Workers’ Ride is a ride scheduled on a different day than the regular brevet so that anyone volunteering to help staff the brevet can get a chance at finishing the ride also. This Workers’ Ride was conducted Audax style, with all of us staying together throughout. However, for most of us, an Audax ride will consist of a team of five riders, occasionally six or seven if there are tandems. This ride had ten of us! The volunteer coordinator, the lovely Megan A, scheduled us for none other than Valentine’s Day, a perfect holiday to be in such great company (ourselves and our bikes!). 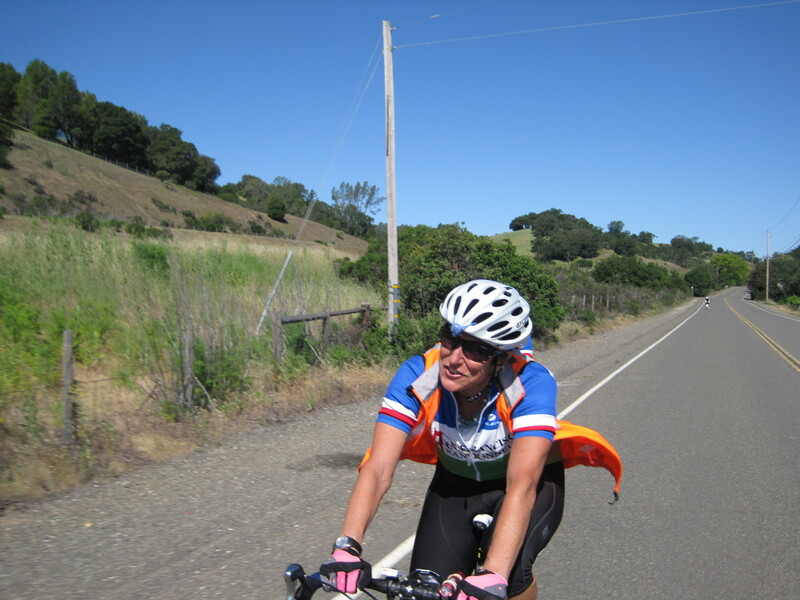 It was a special ride for another of us–Ann K’s first 300k, and a ride following a tough illness at that. This was only my second attempt at a Workers’ Ride (thus the W2 in the title of this post), which I’ve gotten the impression is more often conducted by riders on a much higher cadence than myself. But it was agreed that this would be a no-drop ride, so I gingerly threw my helmet into the ring. Megan was great at reeling in all the diverse natures of the participants that day (need I say more than to mention Jason P was one of the natures? ), and keeping us all together despite the wide range of paces represented. 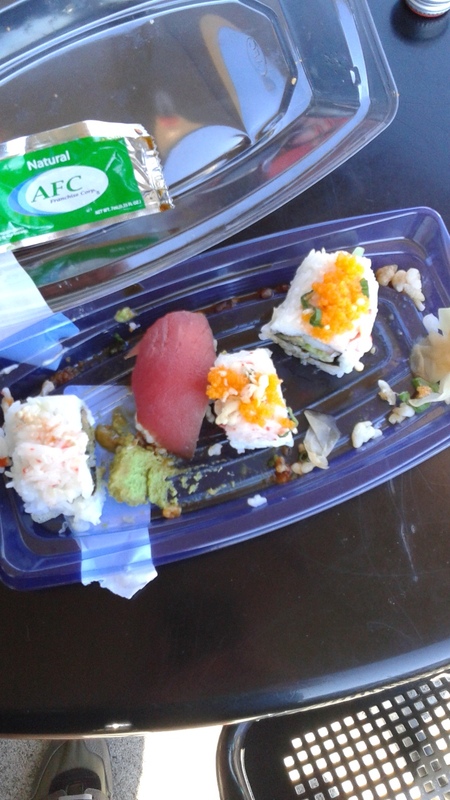 I only have a few pictures I took on my cell phone, but here they are. 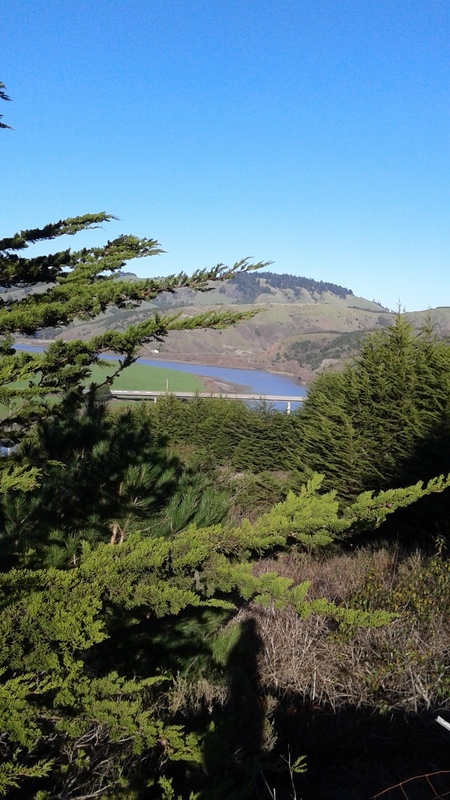 Overlooking the mouth of the Russian River on a beautiful February day, nothing like the beautiful February days where I grew up, but I’ll take it! Many thanks also to Jenny, who procured some caffeine for me when I really really needed it, to Steffen for hanging back with me on the inbound side of White’s Hill, and after all to Jason for buying us all pizza in Fairfax on the inbound (I imagine requesting forgiveness from us for putting up with him all day???). However great the ride was, it was my volunteer shift on Brevet Day that really made this 300k memorable for me. I loooove volunteering as most of you know, and I got the best shift, the last finish control. It was during this shift that I finished my first 300k, rolling in with Jim G, so it was fun for me to staff it. I was working with Bruce, our shift following Jason and Patrick and Ann’s. Jason and Patrick stayed long after the end of their shift, and we all had fun watching Jason taunt the raccoons at the plaza with offers of hugs and Sun Chips…it kept us awake, in any case. I also laughed heartily (on the inside!!) observing one exhausted rider saying she would rather write swear words in her brevet card instead of signing it. A few minutes later, after eating a hefty burrito brought for her by her friend, she took it all back and seemed to be looking forward to her next brevet. Riding brevets is not easy no matter when you finish, and it’s a great feeling to support riders by volunteering in whatever capacity one can. I highly recommend it! Hey, I have my own perm now! Pretty exciting!!!! The route idea originates with my cool boyfriend John P, and is based on a route he and I have been talking about for a coupla years; I just finally got around to doing all the work to make it official. Here is his blog post about riding it from a few years ago. The first part (to Fairfax) is from a Box Dog shop ride from 2008. 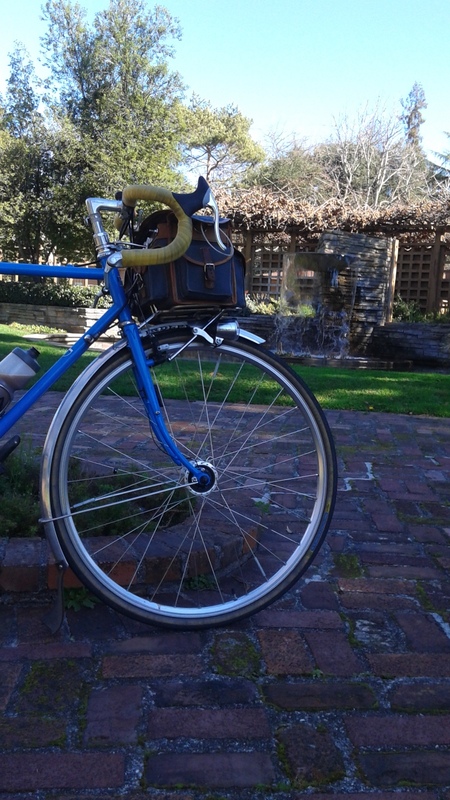 Part of the route was also the same as my first ride out with my blue Pelican, at least the climb of Old Railroad Grade. Funny how things go. I will always be grateful to RideOn member/rando Nick B for taking me out that day. I really had no clue where we were headed, but I was ready for adventure and loved Old Railroad Grade trail right away: it was the new norm, naturally. It feels like completing a circle to now manage a perm using that trail. It is in my bike’s DNA as well as mine. Sooo it should be easy, right? Wellll… ha. I started working on the route in late October, hoping it could be approved for me to use as my December 200k this year. The application and approval process took a lot less time than I anticipated, and Mount Tam to Marshall, Route #2867 was made available to RUSA members to ride for credit in early November. Ten lucky randos enjoyed the ride before I finally scheduled a day for myself to ride it in December. Due to lots of rainy days in the forecast, teaching work on weekends and so on, I settled on an apparent break in the wet weather: the 16th (my lucky number!) as my big day. I had only ridden the whole route once before, with John as a pre-ride and not particularly for time. We putzed around that day, even running into perm owner Mark G on the Cross Marin Trail on his fixie! We stopped and chatted with him for some time. What a great day that was. We had our traditional early dinner in Point Reyes at the Whale of a Deli, mmmmmeatball sub for me and carnitas torta for John. I amply photographed all the controls, poring over the details to come up with good info control questions. I now have almost three complete sets of different questions to ask in case someone rides more than once. Also from the pre-ride: my buddy who lives on Fern Canyon Road. Don’t be stubborn, just keep pedaling! Anyway, I was pretty nervous leading up to my first riding for credit of this challenging route. On paper, there’s a lot of climbing. And the climbing is all loaded into the first third or so of the distance, so you start off feeling behind the clock. I know in my mind that I can make up the time later on the flatter sections, but it was still a cause for worry for me. Would I be able to make it to the Point Reyes timed control in time? Wouldn’t that just be too annoying if I created my own perm and wasn’t able to finish it?? I had brought my nice camera, but ran out of battery in the middle of the Golden Gate Bridge, so I just took snapshots of my bike at the info controls. There are a total of ten controls on this route, six of which are info controls. I didn’t really stop worrying about making good time until I got up Red Hill… then, even with Marshall wall, I started to truly unwind and enjoy the ride. Hicks Valley Road is soooo quiet and beautiful! Shh don’t tell anyone… At that point, the clock unwound too, and as I covered the quieter backroads, time seemed to stand still. I’m glad I got to make the tiny schoolhouse on Hicks Valley Road a stopping point. Last picture before the nice camera ran out of battery–Golden Gate Bridge is extra Orange!! When I rounded the last corner before the West Point Inn, I see a hugely tall figure with his hands in the air calling my name!! When does that ever happen?! Turns out it’s these cool cyclists, coming home from camping on the Mountain of Tam. Control 3: Top of Mount Tam! Too bad the Visitor Center is closed, because I bet they have some great patches! Control 6 is at the end of the second dirt section, the Cross Marin Trail. The trail surface is usually covered with soft pine needles, and the air is filled with the aroma of either wet redwoods or campfire smoke from the Samuel P. Taylor campsites nearby. Again, not a losing proposition either way. Control 7: The little white schoolhouse, built long ago. Still quite small, and still a functioning schoolhouse for the farm families who live out here. I can’t take a picture of it, because I’d be giving away the control question! Oh sweet lord, the tree at the end of the Marshall “wall” climb. It’s really not that bad of a climb, just looong. The long stretch of remote, quiet road is over. Now the route turns homeward on CA-1, a very familiar stretch of road, and destination in itself, for SFR brevet riders. Point Reyes Station, the timed receipt control I was so worried about. I made it with plenty of time to spare, having made up lots of time on the flat Hicks Valley and Marshall Roads. Now I am smelling the barn! There’s a lot to love about this route. There are a couple tweaks I might make if I could redo it, but it’s in the books now, so it has to stand as is. And it was a fair amount of work to create the route, cue, and info control questions, certainly making me appreciate a lot more the dedication, focus, and determination required to create a formal route such as this. A lot of expertise and riding experience goes into making a RUSA permanent route if it’s really good (in the case of Mount Tam to Marshall, the credit for that all goes to John). This one is challenging, though not as much as an Adventure Series ride. It allows riders of normal randonneuring capabilities to enjoy mellow backroads while keeping the amount of climbing doable. It offers a couple dirt trails, though one is flat and the other uphill, so that riders who would like a gradual introduction to mixed terrain riding can have it without any risky technical descents. It also includes three rails-to-trails in their entirety (super duper fancy prize for anyone who can name them in the comments section)! After riding others’ perms for so many years, I am glad I have finally come up with a route of my own to contribute. I can’t wait to come up with some more! Hi there good people of the bicycle persuasion, believe it or not, this is not a dead feed yet! Sorry it’s been so long, yes the time does go by rather quickly these days. Pretty soon the year will be over, and another R-12 with it, with any luck and/or possible blessings from the Spirit of Randonneuring, my collection of guardian angels, etc. I have been extremely lucky so far this year. I have been able to go on some really fantastic rides. My local cycling club happens to be one of the most active randonneuring groups in the U.S., with several great rides to choose from every month. It’s been fairly easy to keep up my R-12 pattern with such an active calendar. In October, I did three different randonnées! and eating excellent burritos in Fairfax. John’s much better at climbing and descending than I, but I try to be good-natured about getting off the bike and walking if I have to, and anyway, I’m much better now than I was a year ago. I’m pretty excited about these new adventures and the new skills I’ve gradually been honing. Writing about randonneuring has gotten a bit complicated this year. Early in the year, one of my dearly cherished amigas was crashed into along with 4 other riders by a drunk driver. They all survived, but sustained serious injuries. Last summer, a young, sweet-sounding, and experienced randonneur was crashed into and killed by an underage driver. The litany of frightening things that can happen while “sharing the road” goes on. I try to be upbeat in this blog, but sometimes it doesn’t feel honest. I know that I am not alone among randos and non-randos in that human suffering such as this affects me deeply. There is a further feeling of injustice about it, since bicycling would appear to be such an innocent activity. The muse does not like the situation, does not like it at all. I guess the muse went on strike for a while. I did not stop randonneuring, but I definitely started orienting myself away from automobile-friendly areas. Sharing a trail with hikers, runners, and other people walking at a relaxed pace instead of “sharing” the road with stressed out texters feels good. finally descending via Bolinas Road into Fairfax, and routing home via the usual roads. The beauty, the remoteness, and the difficulty of this ride was surreal. I didn’t bring a camera, but I did have my phone with me, so the photos are from that. More here. I’m not sure if we rode even 50 miles that day, but it was the hardest ride of the year without question. And it wasn’t a formal ride of any kind (thus the title of this post). Off-road riding seems to be gaining popularity with randonneurs lately. More people are enjoying the “mixed terrain” experience, and in the most recent SFR pair of populaires, more randonneurs chose the mixed terrain option. Many thanks to Carlos D for designing that very enjoyable route. I often think that bikes are only partly-suited to be on roads, and that trails are better designed for the scale and size of a bike. However, trails are also made for hikers, families, and sometimes horses, not just bikes, so bikes are not always entirely suited to be on trails either. Practically speaking, in order to get to a given trail, I ride to the trailhead, so it’s good to be able to ride both on roads and trails. Conversely, the skills developed in mountain biking help a lot in randonneuring. The brevets on narrow country roads with winding descents and highly charactered pavement definitely recall the tougher trail descents for me. Climbing rocky, uneven trails can be more difficult, which makes climbing on pavement seem a lot easier. I guess that is the only disadvantage of mixed terrain riding that I can think of… but the views sure make up for it.